Classic. Easy. Chic. See how to mix and match the classic black and white combo with a bold statement for a professional workwear. There are various styles of Gingham this spring, so the choice is yours. 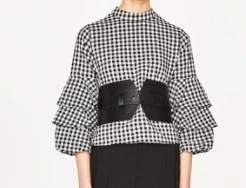 I personally wanted my first gingham to be a piece that I could wear all year around (and affordable), so I opted for this long-sleeves with lower-puffed sleeves and stretchy waist bands (hello, comfort and style)! Scroll below to shop all the trending GINGHAMS from skirts, dresses, jackets, coats, and to blouses! Like many of you, hard-working women, there's just not enough time in the day. Especially in the morning, there's no time to stand around in your closet to pick the perfect work outfit. Also, if you're not a morning person (hands up here), you definitely don't have the patience to wait around your closet while your brain attempts to gather visuals of your clothes and mix and match. And then, the fashion world sent us the gift of Gingham! I love this pattern because it solves all the problems and nuances mentioned above. It's an easy and great go-to piece because you can literally layer it with so many basic pieces: a blazer, a waistcoat, a light trench, denim, etc. You name it! To make this a S/S office/work wear, I paired my gingham with a tuxedo waist coat (sleeveless) with a denim skirt and bold, gold earrings to add shape to my outfit. Don't be afraid to pair bold statement accessories with textured and patterned pieces. They usually can boost your outfit by giving a slight runway touch, like this Chanel BOY Petit Sac. Hope you guys enjoyed this post and found this helpful. I love sharing my personal learnings and tips with y'all but also love hearing and learning from you guys, so definitely leave comments and questions here and on my social channels! Have fun shopping these pieces and much love from Antwerp! Stay Tuned. JOIN MY STYLE JOURNEY AND EXPLORE FASHION IN EUROPE!